Cancun: September 10, 2003. 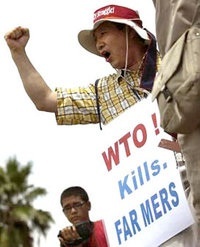 Korean farmer and activist Lee Kyung Hae commits ritual suicide outside a conference hall housing heads of state who have convened for World Trade Organization talks. Seven years later, global leaders descend once more on Cancun, this time to address climate change. As a farmer and President of the Federation of Farmers and Fishermen of Korea, Lee Kyung Hae worked tirelessly to raise awareness of the globalization of his country’s food producing system. With Korea embracing free trade policies and the U.S. and E.U. subsidizing multinational agribusinesses to the tune of $1 billion daily, cheap foreign rice had flooded Korea’s markets, resulting in widespread loss of livelihood for small-scale farmers. Seven years down the line, the same agribusinesses that Lee Kyung Hae mobilized against are stronger than ever. South Korea, the world’s third largest import market for corn – used mainly for animal feed in industrial-scale production– has in recent decades come to depend on corn imports from the U.S. and Brazil. Agricultural corporations Arthur Daniels Midland and Cargill are key players in this trade. In the years since Lee’s death, Korean industrial giant Daewoo has also joined the game. In fact, it was Deawoo’s 2009 purchase of 1.3 million hectares (3.2 million acres) of Madagascar’s land for corn and palm-oil production – dubbed the biggest African land grab to date – that resulted in the toppling of Madagascar’s government. Madagascar subsequently cancelled the deal. Though Lee Kyung Hae took his life protesting the inequities of the global trade of agricultural commodities, multinational agribusinesses also play an important role in climate change. Industrial agriculture’s fossil fuel dependency results in significant greenhouse gas emissions, with the system prizing short-term profit over long-term sustainable resource management. This year in Cancun, I saw no protestors. I also heard no mention of Lee Kyung Hae’s suicide – or for that matter the global surge in farmer suicides. Increasingly, small-scale farmers around the world, unable to compete with industrial production and suffering from widespread climate-induced crop failure, are taking their lives. The same issues that Lee Kyung Hae lived and died for must now make their way into the climate change debate.